This is a high power Online double conversion UPS with rugged design for Industrial environment and suitable for high end power requirements. It can withstand vibrations , dust, mechanical stress and other environmental disturbances. Available in three phase input - single phase output and three phase input - three phase output. This series coming with built-in transformer for Galvanic isolation between input and output and suitable for applications requires isolation from input to output. With better crest factors suitable for loads with surge current requirements. Available in single as well as three phase, the digital servo voltage stabilizer offered by us serves as an effective solution for voltage fluctuation. These are extensively used in communication equipments, computers, special purpose machines and various industrial equipments. Our servo voltage stabilizer is manufactured from high quality raw materials that are suitable for both indoor and outdoor applications. Wide input variation capacity and faster speed correction are the features that make this digital voltage stabilizer widely recommended by our customers all over the country. We are named as one of the prominent digital voltage stabilizer suppliers from India. Technology PWM Technology with High Frequency Switching Type With Built in Isolation Transformer. Input Voltage : 360Vto 470VACfor 3ph. Output Voltage : 400Vor 415VAC. Over load Capacity 150% Over Load for 60 sec. 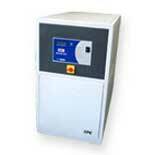 Protections Input : Mains Over Voltage / Under Voltage / Spikes/Surges/Single phase. Battery : Over Charge/ Low Voltage. Output : OverVoltage / Over Load / Short Circuit/ Single phase.